A limited number of remaining tickets for the 2018 College Football Playoff Semifinal at the 104th Rose Bowl Game presented by Northwestern Mutual will go on sale Wednesday, December 6 at 9 a.m. PT/ 12 p.m. ET. Tickets will be available online or by calling Ticketmaster at 1-800-653-8000. 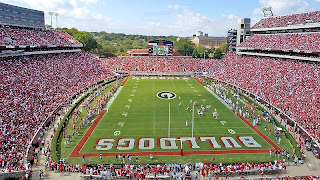 Oklahoma will occupy the west sideline (press box side) and have their colors painted in the north endzone, while Georgia will occupy the east sideline and have their colors painted in the south endzone. A maximum of four tickets per person will be available during the Rose Bowl Game ticket pre-sale. Individual ticket prices start at $185 plus Ticketmaster handling fees.